The place shows you the Gurudwara of Shri Kartarpur Sahib, which is placed at a distance of 4.5 kilometers in Pakistan. Shri Kartarpur Sahib has historic and a remarkable religious importance, the first guru of sikh religion Shri Guru Nanak Dev ji after compliting four journeys reached here in the year 1522. 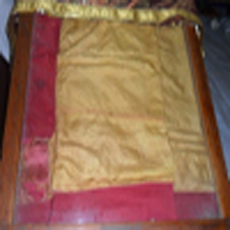 He started living a simple life and field his land for a period of 17 years 5 months and 9 days, then Guru Nanak Dev Ji bestowed Guru ship to Guru Angad Dev ji (Second Guru of Sikh religion) along with symbol of Udasi dress including holy robe, from this place Guru ji gave the greate message humanity "KIRAT KRO, NAAM JAPO, VAND CHHAKO" which he adopted throughout his life, in the year of 1539 Guru Ji left for heavenly abode. 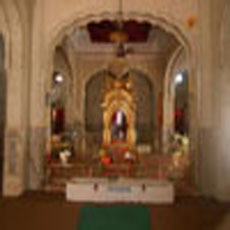 This spritual Gurudwara is shown from border of Dera Baba Nanak which is at distance of 2 kilometers.